I've just taken on an abandoned wooden Enterprise from my sailing club with the intention of restoring it to it's former glory. I spent some time comparing potential project boats and think I've dropped lucky with this one as most of the work (that I've identified so far! )isn't particularly skilled, which suits me. The trickiest job seems to be that I'm going to have to either repair or replace the transom but apart from that she looks to be be solid. All of the paint and varnish is going to have to come off though which leads to my question. I don't have a garage and the sailing club shed is fully booked for the winter. There's no chance of stripping, sanding, possibly patching, prepping and re-varnishing/painting in one gloriously sunny day this autumn/winter. If I'm taking off all the varnish and paint and then leaving the boat (under it's own cover) for a week before I can get back to it, am I likely to find more damage caused by the weather while the wood is exposed? It sounds like I really need to be finding some sort of cover then. Either by moving the boat somewhere dry or erecting some sort of temporary structure. I hadn't thought of the coop idea I'll be checking that out on the web later. I'm carrying out a "does she float and where does she leak" test this weekend. I've asked my daughter to sit in her for half an hour and report back but she doesn't seem keen. Looks like I may be getting wet! Looks similar to boats at IYRS (International yacht restoration school) in Newport Rhode Island, the students there take boats similar to yours and some are in a lot worse condition. I once built a 28 foot Wharram catamaran a storage facility which are a dime a dozen in south Texas . It's small enough you might be able to build a temporary shed over it but work fast as your neighbors are sure to object. 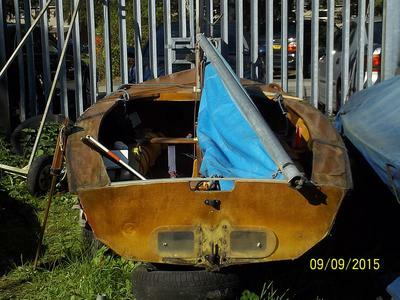 Nice project think bill gave you a good start, had the same boat but mine had spring in it and water. But came with a trailer that was the plus for me. Once I had cleaned it and you really have to look for soft spots in the deck and it could be saved but if i wanted the same look as the inside. A drain line between the lamination and this had become plugged. This also gives you a look inside your flotation tanks, they were good some sort of green preservative but the channel from the bow to the stern was the problem. No computers back then no MIKE. I WAS ON MY OWEN and like yous the deck had been done before, you can see it in the picture, just aft of the flotation box. I think this was one piece, a clean line just aft of the fore peak. I made the fore deck one piece with tow 45 tails with a support for strength to scarf the aft deck. The root looks the same, took out the self balers, made new plugs put them back in. This boat was a good sail. I got a moble garage 10 x20 easy to set up for a day or so, and work under that and keep boat covered. save a boat. She looks like a worthy project. The main thing is to keep the rain off her but allow the air to circulate. And keep her off the ground, on her trailer will be fine.